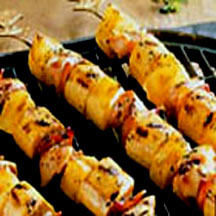 CooksRecipes has quality, kitchen-tested recipes for chicken kabobs that you can count on for successful deliciousness. 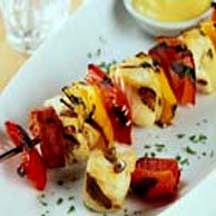 Traditionally, kabobs are chunks of meat threaded onto a stick, usually with chunks of veggies and/or fruits, and cooked over a hot fire—but these days, they're usually done over a hot grill! They are also known as kababs, kebabs, kebobs, skewers and satays. This grilled kabob recipe pairs the rich, flavorful thigh meat of chicken with strips of bacon, plantains and sweet, fruity pineapple. 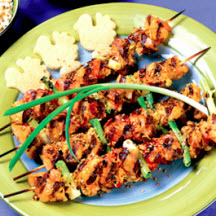 The cumin aïoli perfectly complements the taste of these flavorful skewers of chicken and chorizo sausage. Recipe provided courtesy of the National Chicken Council.